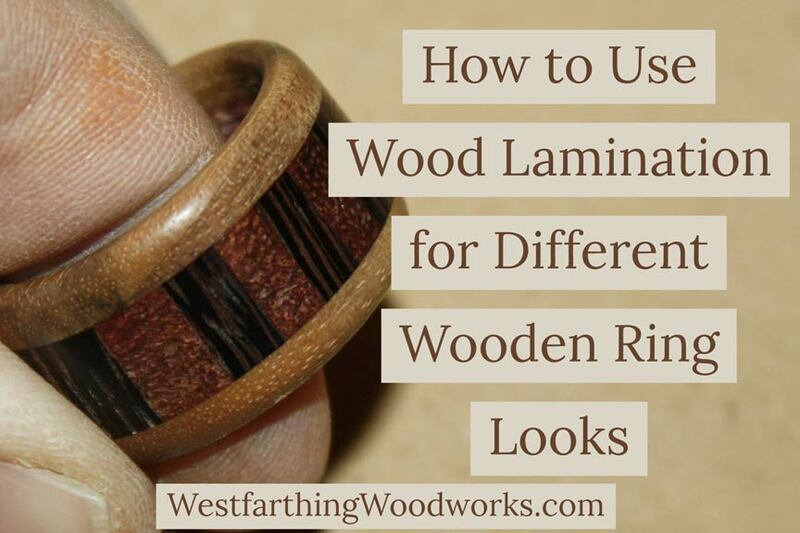 This is how to use wood lamination to showcase different wooden ring looks. The most popular way of making a wooden ring is through using different layers of wood to create a certain look. Here is how you do it, and create more variety with the same materials. Wood lamination is the process of taking several pieces of wood and gluing them together to form a larger blank. The blank is then used for whatever project it was made for. 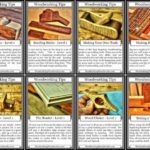 Most of the time, wood lamination is used to create a certain look, though sometimes it’s to create bigger boards when only smaller boards are available. In order to make a laminated blank, you first need to have the materials. These are easy to come by, and you can either buy them or make them in the shop. Thin sheets of wood, that range from about 1/2 inch to 1/4 inch are ideal. Glue these pieces together to create a flat blank, which when viewed from the side will show you what the resulting ring will look like. Once you have a look that you like, simply add glue and press the pieces for a few hours or overnight until the glue has dried. See Making a Laminated Ring Tutorial for detailed instruction on the lamination process if you are brand new. 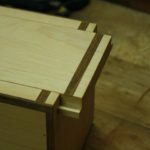 Remove the piece from the clamps and inspect the lamination. It should be free of defects like gaps between the layers. 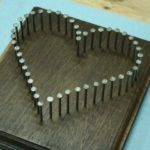 If the blank is good looking and well made, you can then start planning ring designs and drilling the finger openings. The real secret that wood lamination unlocks is making rings with different looks. 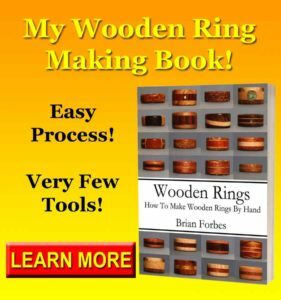 The math is really easy, and once you understand the sheer volume of rings that you can make using this one simple technique, you will use it all the time. For example, if you have five different wood species in the shop, and you only make solid rings, you only have five different options for looks. Even in a simple three layer lamination, you would have five choices for each layer, meaning 125 different looks. It’s easy to see how adding layers multiplies your options for making and potentially selling what you make. If you go to a show with that same wood set, you now have 125 different offerings instead of five. This makes you better suited to sell, because everyone likes something different. One of the most important things to get right is the fit, and you can use my Ring Sizing Guide to convert ring sizes to drill sizes. There are a few common designs that are made through lamination, and this is because they are really pleasing to look at. Try these patterns in the beginning, and you will have a nice creative head start on what you can make. The first is the contrasting lamination. This is a simple two part ring made with two pieces of contrasting wood. Select your pieces well, and let the big difference in looks between them stand out. This is what makes them look good. Another common design is a three piece, with a contrasting species in the middle. Make the faces of the ring from the same species, then pick out a contrasting species for the middle. You can also make the middle section larger if you want. Finally, a three piece ring with veneer in the middle layer is also popular. Select one of two species for the outsides, then layer a piece of veneer in the middle. It’s best to use contrast again like the last ring, and the veneer makes a nice fine line. If you want a challenge, think about making a Complex Laminated Ring. It’s essentially the same technique, just with more gluing and a more interesting blank. Your homework is to try laminating a few blanks in the shop and making some rings. If you need instructions, my post on How to Make a Laminated Ring will give you step by step direction. It’s an easy process. Try to make the wood that you have look better than it already does. All you really need to do is create some laminated blanks, and let the different woods show their look. Play around with the lamination looks, and decide on what you like before you add any glue. When you blanks are dry, drill them and make rings as you would normally. 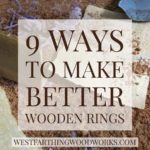 See if they are better received by your customers or your friends, and if they are, then you can continue to make even more wooden rings with laminated wood. 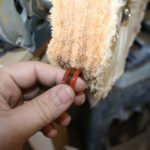 The easiest way to increase the number of possible rings you can make from the same few pieces of wood is through wood lamination. Wood lamination showcases the most different looks, and can make you a better ring maker simply from a higher number of choices. 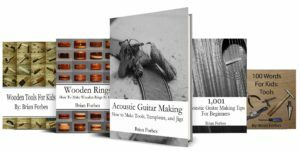 If you only have a few types of wood, making blanks from several layers multiplies the amount of rings you can make exponentially by the number of layers. For example, a five layer ring, made from a possible eight different species of wood can be made over 32,000 different ways! When you add layers, and start multiplying, the number of possibilities goes up really fast. This is how you ensure that you get more variety from the same pieces of wood, and that your designs never get old or too similar.